Leche Flan is a popular dessert in the Philippines, it is from the same family of cream caramel, crème Brule, and custard. The only downside of leche flan is the fact it’s too sweet and too thick and has just so many egg yolks. 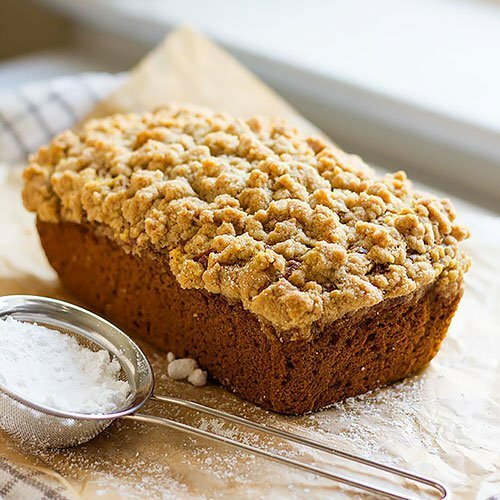 My version is lighter yet creamy and delicious. With the original leche flan recipe, you won’t be able to have more than few spoons, at least I can’t, although I love this dessert. However, it is too thick and too rich, I must stop at the third spoon. Of course, there are many who enjoy the original recipe and I’m not complaining, leche flan is wonderful. The leche flan recipe I’m sharing today has almost the same taste but is not thick, it’s lighter in calories and you’ll enjoy your portion without the guilt. 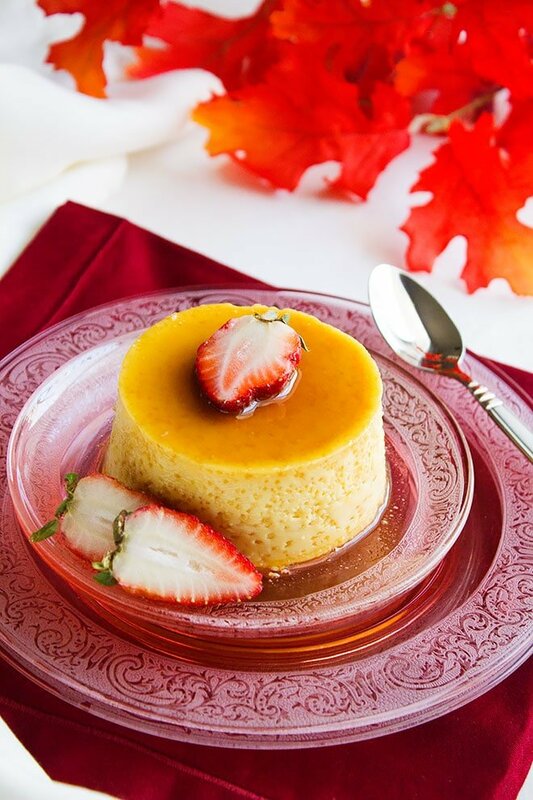 There are few things that you should keep in mind when making leche flan or any other custard-like dish. You shouldn’t over bake leche flan, once it is over baked the texture will turn into sponge-like and the milk will curdle. 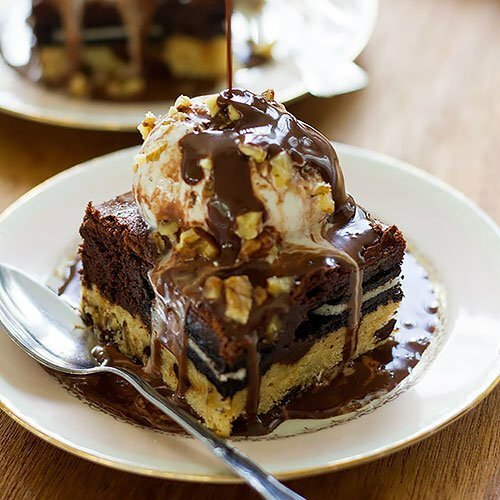 When making the caramel, make sure to remove it from heat when it turns golden, since the sugar at that stage keeps on cooking and will get darker and may burn. Finally, for a better creamier texture it’s better to have all the ingredients at room temperature. In a saucepan, add sugar and two tablespoon of water. Cook the sugar until dark golden, remove immediately from heat and pour into four ramekins. The ramekins should take around ½ cup liquid. In a bowl, add the eggs and vanilla, whisk for two minutes. Add the condensed and the evaporated milk and mix well. Strain the mixture through a strainer while pouring it into the ramekins. Place the ramekins in a large and deep baking pan. Fill the baking pan with water until it reaches half the ramekins. Bake the leche flan in a preheated oven of 375F/190C for 25 minutes or until a toothpick inserted in the middle comes out clean. 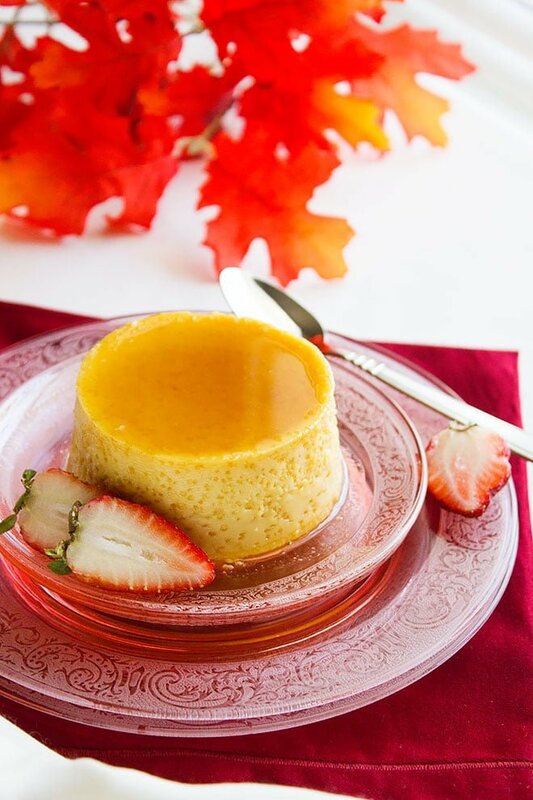 It’s better to check on the flan every 10 minutes to avoid overbaking. 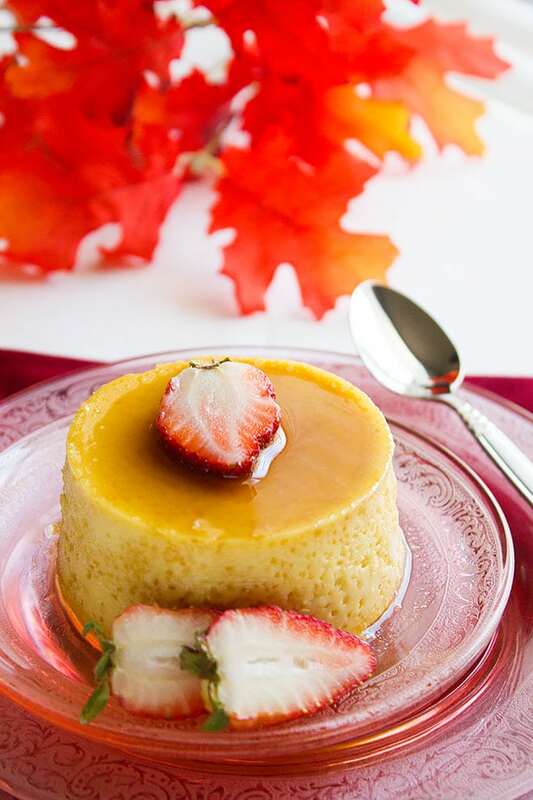 Cool the flan completely then refrigerate for at least an hour before serving. 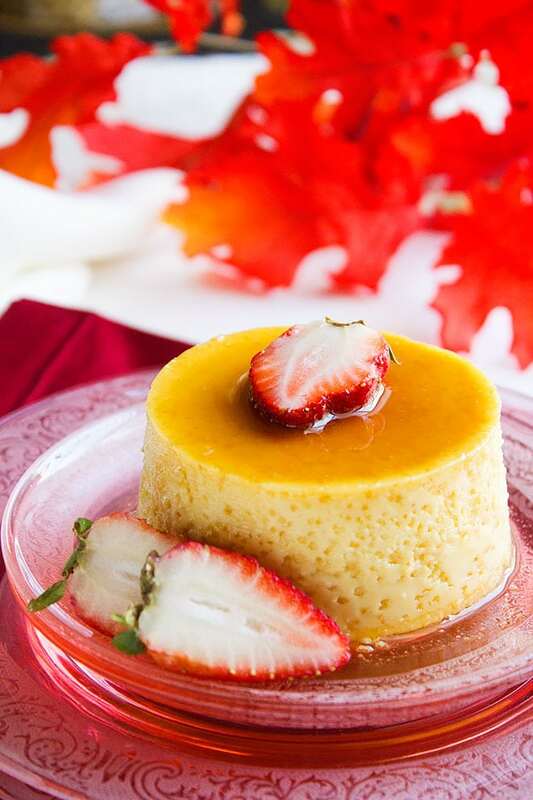 To serve it on a plate, run a butter knife around the edges of the flan, then inverted in your serving plate. I can’t wait to try this. Flan is one of my favourite desserts but like you I find it to rich sometimes. This sounds perfect! That’s why I only tasted once when I was in Manila and had just one bite…it was beautiful, delicious and exactly like what you said SWEET. Your lighter version sounds and looks very tempting, Muna. Lovely. 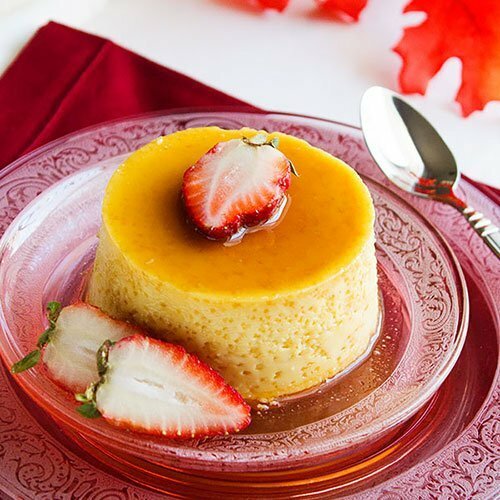 I love flan and I have been making the lighter version since years. I do indulge in the authentic recipe at times but can’t have much of it considering how rich it is.